Lots more of this fabulous exterior finish coming soon! 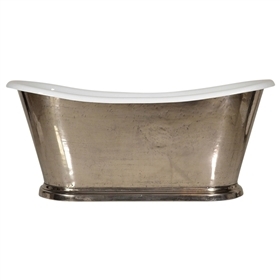 We show only a limited tub selection in our Polished Nickel finish category and will be continually adding new tubs. If you have a particular preference, please ask, we can finish almost every tub, including clawfoot tubs in polished nickel. For appearance and ease of cleaning, each tub exterior is finish protected with four layers of natural beeswax. While the natural metal finish may alter in color and patina during its' lifetime, in polished nickel, any change will occur extremely slowly and will be imperceptible from day to day.